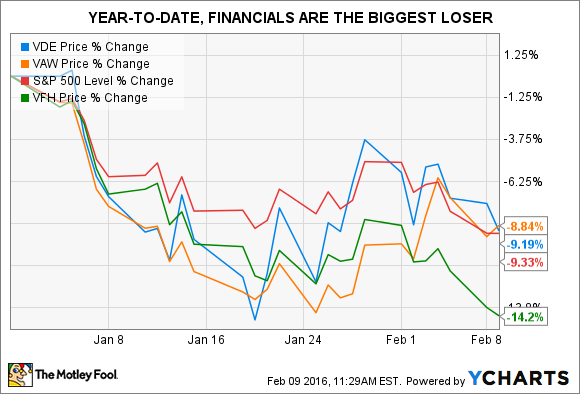 The financials sector has taken a beating this year, creating opportunities for patient, value-driven investors. U.S. stocks are lower in early afternoon trading on Tuesday, with the Dow Jones Industrial Average (DJINDICES:^DJI) and the S&P 500 (SNPINDEX:^GSPC) down 0.48% and 0.47%, respectively, at 12:40 p.m. ET. Shares of Bank of America and JPMorgan Chase & Co. are underperforming, down 0.41% and 1.54%, respectively. The JPMorgan Chase Tower at 270 Park Avenue in New York. Image source: Reading Tom, republished under CC BY 2.0. Pop quiz: What's the worst-performing sector in the S&P 500 so far this year? In fact, both those sectors were outperforming the index as of Monday's close (albeit by a small margin). The median year-to-date total return for financials is (13.7%), according to data from Bloomberg. Banks were at the heart of the global financial crisis (as the original source and repository of leverage, that's invariably the case for any significant crisis). With the memory of the credit crisis seared into investors' consciousness, banks have been a barometer of macro sentiment and the current mood is clearly risk-off. Concerns about turmoil in oil and commodity markets, a slowdown in emerging markets (most notably China), and whispers of the threat of a recession in the U.S. have conspired to throttle bank shares. Some of that process is a reasonable reaction to the facts on the ground, as the normalization in the yield curve appears further away than when the Fed finally opted to lift interest rates off the floor in mid-December. The yield curve charts prevailing interest rates for different maturities. That isn't incidental for banks, which earn their keep on the spread between the rate at which they borrow (the short end of the yield curve) and the rate at which they lend (the long end of the curve). As Financial Times noted yesterday, "The yield curve is at its flattest in almost nine years." In addition, a plummeting price of oil naturally raises concerns about the potential losses on loans to oil and gas companies. However, fixated on the downside, Mr. Market now appears to have overshot. For example, shares of Bank of America are currently changing hands at roughly a 20% discount to their tangible book value (tangible book value excludes the rather nebulous goodwill). This columnist believes that, in the wake of the credit crisis, the bank's balance sheet is marked conservatively. The notion that one of America's top banking institutions will be unable to earn its cost of capital over a full economic cycle stretches credulity. If that's the case, the U.S. economy may as well close up shop. If you want to move up the quality scale, JPMorgan Chase, one of the best-run banks in the world, trades at less than a 20% premium to their tangible book value and, as with of Bank of America, there is every reason to think that book value figure is reliable. Buyers of these stocks should not shoot for the moon -- these are megacap institutions, not venture capital investments. However, moonshot returns aren't necessary to do very nicely over the long term. For stock pickers, the objective is to outpace the S&P 500 (or a similar broad equity index), and shares of Bank of America and JPMorgan Chase look poised to do exactly that over the next three to five years.